Ms. Baker was an educator, an activist, and a leader who worked with numerous organizations and touched the lives of many. Some of the most notable organizations are the Mississippi Freedom Democratic Party (MFDP), Students for a Democratic Society (SDS), the National Association for the Advancement of Colored People (NAACP), and the Student Nonviolent Coordinating Committee (SNCC). 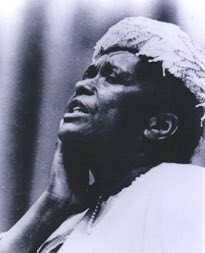 Ms. Baker passed away on December 13, 1986, in New York. She has been recognized by many as the mother of the Civil Rights Movement. What is Ella Baker Day? Beyond recognizing the many contributions of this amazing individual, the Ella Baker Day campaign aims to draw greater attention to the ongoing value of community organizing and roles that women and people of color have played in the creation of our Commonwealth and this nation. In an effort to further the goals of the Support Ella Baker Day campaign and to further educate people on the legacy of Ella Baker, we ask you to consider hosting your own Ella Baker Day in your community during the month of April. Please see the Host Your Own EBD page for more information.